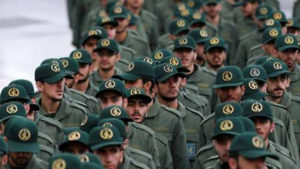 WASHINGTON, DC, USA (AP) — The United States yesterday designated Iran’s Islamic Revolutionary Guard Corps (IRGC) a foreign terrorist organisation, an unprecedented declaration against a foreign Government that may prompt retaliation and make it harder for American diplomats and military officers to work with allies in the region. It is the first time that the US has designated an entity of another government as a terrorist organisation, placing a group with vast economic resources that answers only to Iran’s supreme leader in the same category as al-Qaeda and the Islamic State. “This unprecedented step, led by the Department of State, recognises the reality that Iran is not only a State sponsor of terrorism, but that the IRGC actively participates in, finances, and promotes terrorism as a tool of statecraft,” President Donald Trump said in announcing the measure. Secretary of State Mike Pompeo said the designation is intended to increase pressure on Iran, isolating it further, and diverting some of the financial resources it uses to fund terrorism and militant activity in the Middle East and beyond. But, in addition to the potential for Iranian retaliation, it complicates a delicate balance for US personnel in at least two key countries. The Pentagon and US intelligence agencies had also raised concerns about the impact of the designation if the move did not allow contact with other foreign officials who may have met with or communicated with Guard personnel. Those concerns have in part dissuaded previous administrations from taking the step, which has been considered for more than a decade. National Security Action, a group made up of mainly former Obama Administration officials, said it would put US troops at risk while jeopardising the 2015 nuclear accord with which Iran is still complying. It also blocks any assets that IRGC entities may have in US jurisdictions and bars Americans from any transactions with it. When it takes effect next week, it will allow the US to deny entry to people found to have provided the Guard with “material support”, or prosecute them for sanctions violations. That could include European and Asian companies and business people who deal with the Guard’s many affiliates.